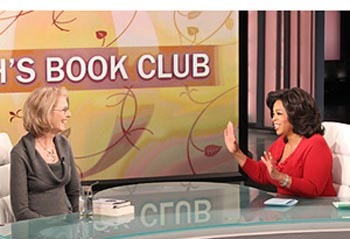 Award-winning author Jane Smiley and Oprah Winfrey discuss Charles Dickens in a webcast video broadcast to an audience that included more than two million of Oprah's bookclub members worldwide. Pulitzer Prize-winning author Jane Smiley lauded UCSC’s annual summer celebration of writer Charles Dickens during a recent interview with Oprah Winfrey. Their chat took place for a special full-length Oprah’s Book Club webcast vdeo, broadcast to an audience that included more than two million of her book club members from around the world. Winfrey and Smiley discussed the latest Oprah's Book Club picks--A Tale of Two Cities and Great Expectations—two classics written by Charles Dickens. “There’s a huge Dickens festival every summer at UC Santa Cruz, open to the public,” noted Smiley at the end of the interview. Now in its 31st year, the “Dickens Universe” at UC Santa Cruz combines elements of a research symposium, arts festival, book club, and summer camp--all rolled into one big, unforgettable week of intellectual celebration. Each year in mid-summer, it brings together scholars, graduate students, high school teachers, and members of the general public for a week of study on the UCSC campus. The annual gathering is the focal point of UCSC’s renowned Dickens Project—now heading into its fourth decade as the premier center for Dickens studies in the world. A scholarly consortium headquartered at UC Santa Cruz, the Dickens Project consists of members from more than 30 universities across the United States and around the globe. “Like Oprah's book club, the 'Dickens Universe' appeals to a broad audience--participants range in age from high school and college students to senior citizens,” noted UC Santa Cruz literature professor John Jordan, director of the Dickens Project. "They come from a wide variety of backgrounds--teachers, retirees, members of the general public, anyone who likes to read Dickens,” he added. The program is residential and lasts for a week. Participants stay on campus and eat in the college dining halls. “Unlike most scholarly conferences, which last only a few days and where scholars talk only among themselves, the 'Dickens Universe' mingles people of different backgrounds and levels of expertise,” said Jordan. It also includes social events, film screenings, Victorian teas, and an evening of Victorian dancing with a live band and a dance instructor. The 2011 Dickens Universe celebration will take place at UC Santa Cruz from July 31 to August 6. As Smiley noted, this year’s highlighted book will be Great Expectations—coincidentally the same book Oprah has selected for her book club. For more information about the 2011 Dickens Universe, visit the Dickens Project web site.